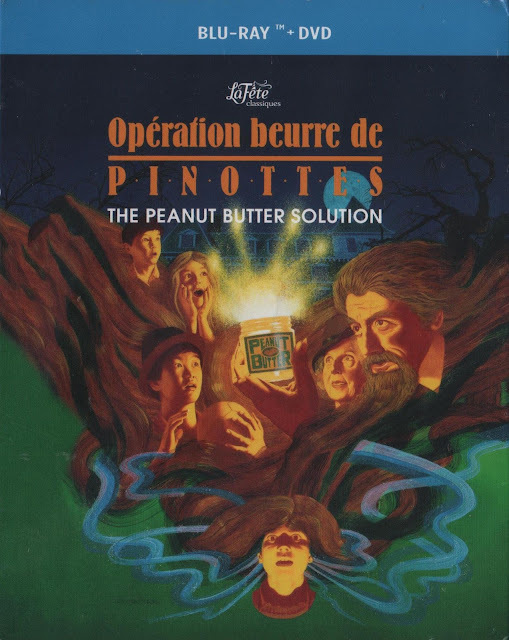 Those who have long wanted to rewatch The Peanut Butter Solution will be pleased to discover that the 1985 movie has finally been released on DVD and Blu-ray disc. For years, the only option for watching this movie was a very dated VHS videotape. A choice which, because of rarity, had become expensive and necessitated the owning of a VCR. It is a French Canadian release, which explains the confusing text on the cover. However, both the blu-ray and the DVD disc have a copy of the movie in English and in French so you can buy it knowing you will be able to view it in the language you prefer. Also included in the case is a small booklet with pictures from the movie. Unfortunately, the text within that booklet is only in French. If you have long wanted to own this movie, you can buy your copy from eBay by clicking here. Buy The Peanut Butter Solution from eBay. Read my complete movie review. The Peanut Butter Solution recipe for baldness.